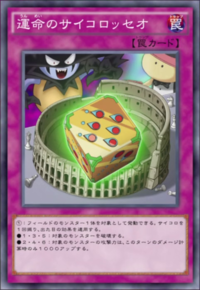 This card is not a member of the "Dice" archetype, because its Japanese name does not contain 「ダイス」. Target 1 monster on the field; roll a six-sided die and apply the result. ● 1, 3 or 5: Destroy that target. ● 2, 4 or 6: This turn, that target gains 1000 ATK, during damage calculation only. This page was last edited on 18 June 2017, at 22:11.